Rates from 160 EURO per person including bus from Istanbul and back. 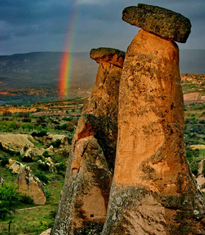 Depart from your Hotel for Red Valley, presenting an opportunity to hike through orchards and vineyards, between fairy chimneys and rock-carved houses. Continue the walk in Rose Valley. Afterwards, visit the old Christian Village of Cavusin. Following a lunch break, visit Pigeon Valley, so named after the hundreds of little windows carved into the rocks to attract nesting pigeons. 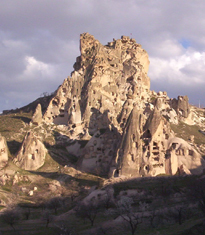 Then visit Kaymakli Underground City, Ortahisar Castle .